Yang Zhichao is known as one of the most extreme performance artists in contemporary China. He turns to gentler tactics in his monumental installation ‘Chinese Bible’ (2009). To create the work, the artist collected notebooks and diaries from markets, in particular the Panjiayuan Market in Beijing. Dated from 1949 to 1999, these books contain the personal notes and writings of generations of Chinese people. Together they become a testimony to private experiences in a century of political upheaval and oppression. Critic and art historian Thomas Berghuis writes that 'Chinese Bible' is a natural extension of Yang’s performance practice, in which the artist often meshes the private with the public – for example, he documents his own sexual life in ‘Love Story’ (1996–): ‘For Yang, private life, his own private body, and his public role as an artist are immanently tied together.’1 Here in ‘Chinese Bible’, however, Yang focuses on the private lives of other people. These diaries can be considered as aesthetic objects in and of themselves. Nonetheless they signal broader cultural and political contexts. Further, during the punitive period of the Cultural Revolution (1966–76) the very act of writing diaries potentially endangered the writers. Many of these diaries show the ways in which ideology permeated individual lives. Some contain patriotic images of workers, farmers and political leaders united by a common purpose, while others convey patriotism, melancholy and barely suppressed anger in their written content. The artist notes that the tone of the diary entries shift over decades: ‘The Cultural Revolution politicised and standardised personal life. Notebooks in the form of diaries reserved a private space for people to express changes in emotions and behaviour against the current in social movements.’2 Yet he also notes that those ‘prior to 1979 depicted a common tendency towards one political position’,3 revealing the ways in which beliefs and opinions often flow with the political current. Yet each diary manages to convey an individual experience of the world. For example, between the pages of one book there is a flower that has been pressed – perhaps a memento of an unknown event, abandoned eventually by its owner to become part of the broader ebb and flow of archival materials in China. 1. 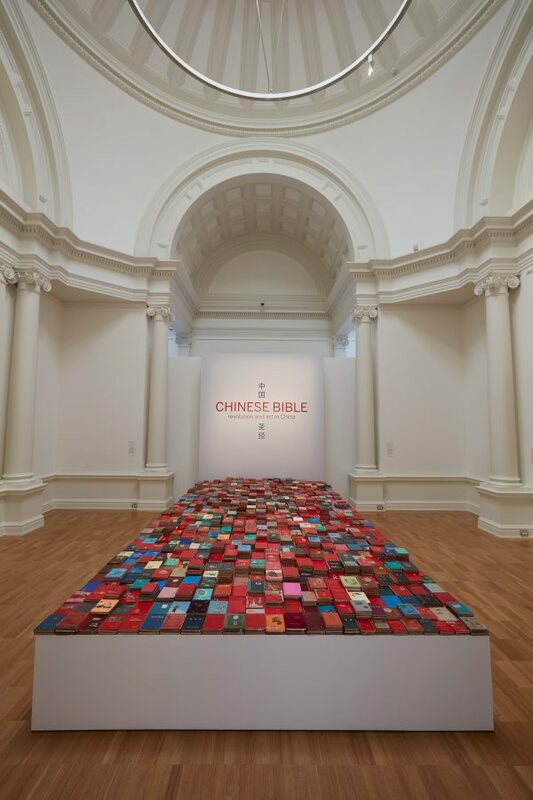 Thomas Berghuis in ‘Chinese Bible: Yang Zhichao’, exh. cat., 10 Cancery Lane Gallery and Katie de Tilley Contemporary Artists (Hong Kong: Vibrant Life Publications, 2011), p. 4. 2. Yang Zhichao, ’50 Years of History in Notebooks’ in ‘Chinese Bible: Yang Zhichao’, 2011, p. 8. Jane Albert, Broadsheet , 'All Eyes Go East', Sydney, 10 Jun 2015. Thomas Berghuis', Chinese Bible 1949-2009 , 'Chinese Bible', pg.4, Hong Kong, 2011, 4, 8. Linda Jaivin, Look , 'Eastern influences', pg.18-21, Sydney, May 2015, 20.